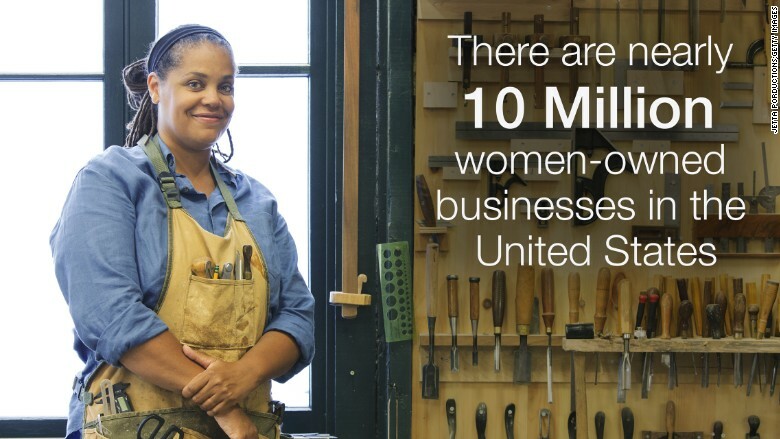 When it comes to small business in the United States, more women are running the show. On Wednesday, the National Women's Business Council released an analysis of preliminary Census data which showed there were nearly 10 million women-owned small businesses in the U.S. in 2012, a 27.5% increase from 2007. (The Census defines a woman-owned business as one where a woman owns 51% or more of the business equity or stock). While men still own more businesses than women, women-owned businesses grew at a rate of four times that of male-owned businesses. In 2012, men owned nearly 15 million businesses. Overall, women-owned businesses earned a total of $1.6 trillion between 2007 and 2012 and the vast majority (89.4%) were run by sole proprietors, meaning the only employee was the owner. The report, which pulled data from the Census's Survey of Small Business Owners, also highlighted major increases in small business ownership among women of color, particularly black and Hispanic women. One notable trend that may have had an impact: Blacks and Hispanics had consistently higher rates of unemployment from 2007 to 2012 than white or Asian women. In addition, in 2011, Black and Hispanic women were also more likely to be the financial head of household than Asian and white women. "We speculate that there may have been a bigger necessity among women of color to start their own businesses," said Carla Harris, the chair of the National Women's Business Council who was appointed by President Obama. "Necessity is the mother of invention," she added. While the economic strains women of color faced during the recession may explain part of the reason many of them became entrepreneurs, Harris also attributed the growth, in part, to "increased necessity for women of color to supplement either their existing income (as they are often paid substantially less than the national average) or creating a primary source of income." White women still own the majority of women-owned businesses in the U.S. (6.1 million), and earned significantly more at an average of $214,000 in 2012. 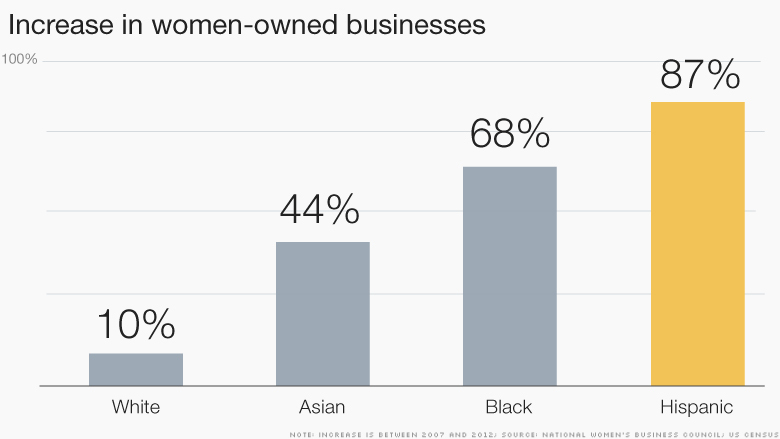 That's compared to average earnings of $79,000 for businesses owned by women of color. However, only about 10% more white women started new businesses between 2007 and 2012, the smallest percentage increase of all female entrepreneurs surveyed. The largest percentage increase in business ownership, however, was among Hispanic women. In 2012, there were nearly 1.5 million small businesses owned by Hispanic women, an 87% increase from 2007, with these businesses generating a total of $83.6 billion in that same period. Business owned by Hispanic men grew by almost 40% from 2007 to 2012. California was the state with the highest percentage of business owned by Hispanic women. Black women also saw impressive gains in small business ownership with more than 1.5 million black women-owned businesses in 2012, a 67.5% increase from 2007. Those businesses generated a total of $44 billion in that same period. Georgia was the state with the highest number of black women owned business.Since 2007, business ownership among black men increased by nearly 19%. While Asian-American women owned the smallest number of small businesses in the U.S., they still saw a 44% increase in ownership from 2007 to 2012. In that same period, businesses owned by Asian-American men grew 25%. California was the state with the largest number of Asian-American women-owned firms. One hurdle facing women entrepreneurs of all races and ethnicities was access to capital, the National Women's Business Council report said. According to the report, women start their businesses with half as much money as men do, and they are more likely to use personal savings to do so. They are also less likely to access bank loans than men are. Harris said the National Women's Business Council would continue to analyze the data particularly when it comes to the age of the entrepreneurs. "Millennials have an increased appetite for entrepreneurship relative to the boomers and traditionalists," Harris said. "We suspect that is part of the increase as well."